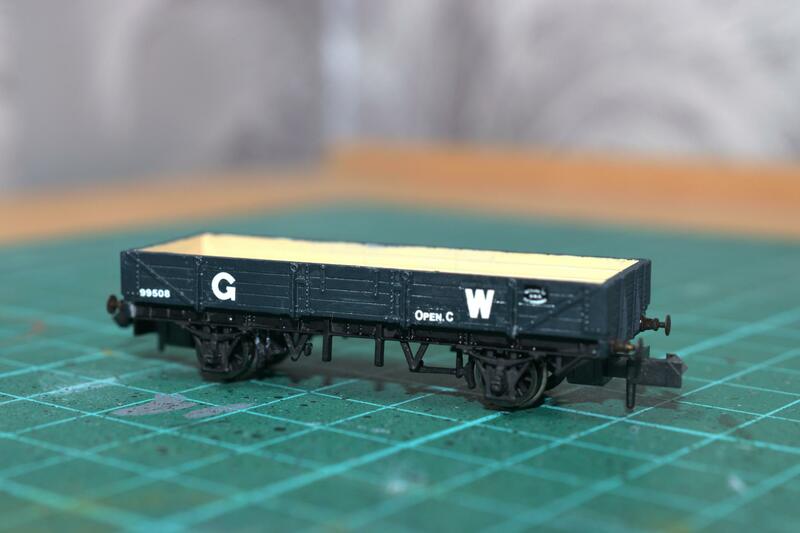 After building the coal wagon and cattle truck (see my other post elsewhere on the forum) I thought I make a start on the coach conversion I've been wanting to do ever since Bernard Taylor first put the kit up on his website. I finally managed to get my hands on a H38 kit a couple of months ago and so yesterday afternoon I made a start on the chassis. An extra white metal battery box, a pair of white metal dynamo's and 4 pieces of 3.2mm dia styrene rod 1/2" long to make the gas tanks. All held in place with quick set epoxy adhesive. 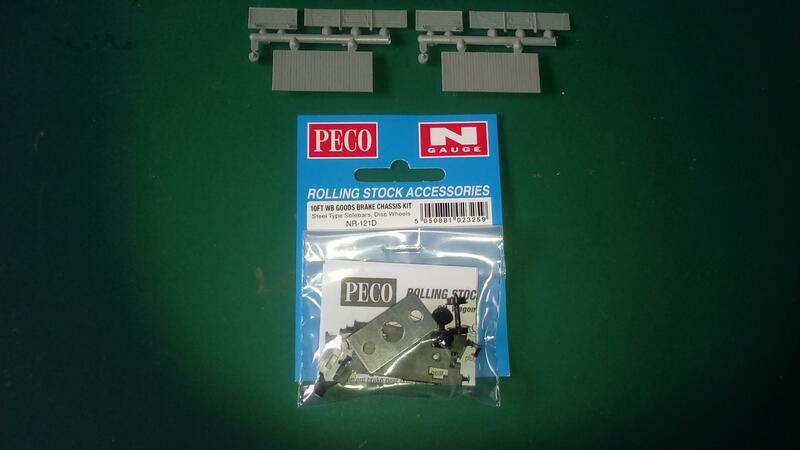 I also had to make a slight alteration to the 9ft Dapol autocoach bogies so they sat flat and rotated smoothly (this isn't mentioned in the instructions by the way). Next job, paint it all a nice flat black to match the rest of the chassis. Then tables, diners, and a proper paint job on the seats. The body modifications will follow once I've got that far. Making unusual coaches like restaurant cars is fun One quibble, though: are you sure about the two dynamos? All the coaches I've ever seen (and the reference photos of H38s I have) only seem to show one. Comet Models do a H38 in 4mm - their website is very useful for underframe and roof plans (and general notes): see http://www.cometmodels.co.uk/data/Catalog/pdf/W26.pdf These aren't infallible, though, as it's noticeable that the PDF shows only two battery boxes opposite each other, but the photographs in Russell show three. The two dynamos could be wrong, who knows? It's very hard to find good photographic evidence of what is under most coaches at the best of times so I'm going to employ that good old standby, "modellers licence". 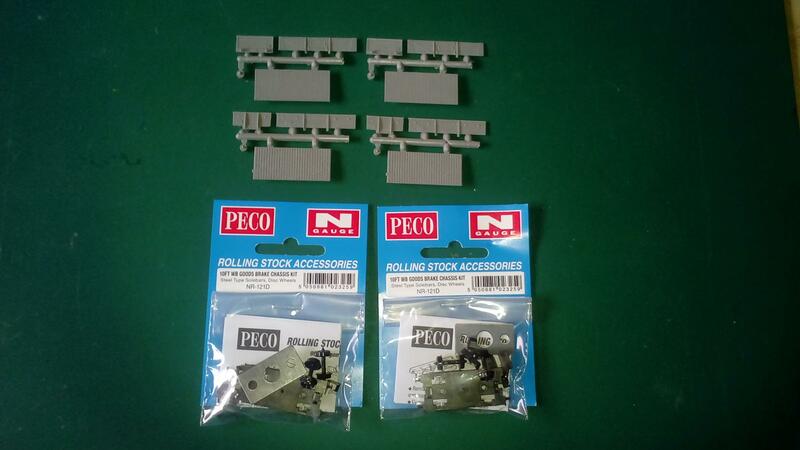 I've made a couple of tweaks to the dapol autocoach bogies so that the sit better and rotate freer and I now have a painted rolling chassis. Next stop, the body. So, having added the extra underframe parts necessary for a restaurant car. A couple of coats of black paint and hey presto, a rolling chassis. I'm still undecided on whether to use the turned brass Collet buffers or stick with the moulded ones. Anyway, now on to the body. Hi folks, Twinklekev here again. Mrs Twinklekev hasn't been well lately so modelling has had to take a back seat to domestic chores. 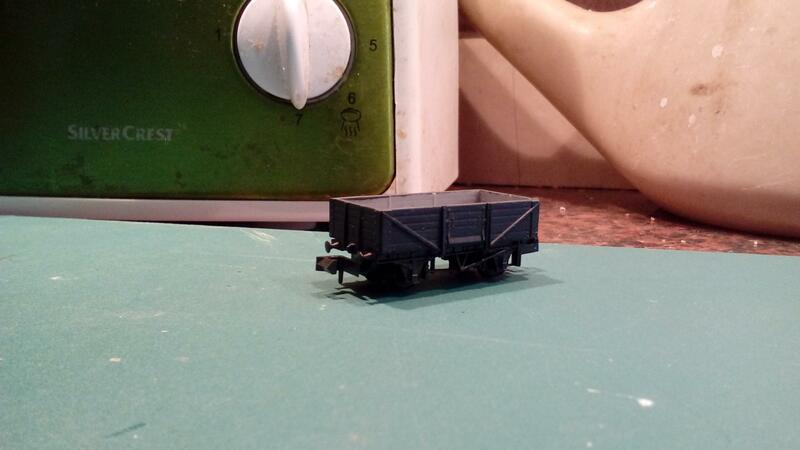 Anyway, I found some NGS mineral wagons on a well known auction site, put in a bid and blow me if I didn't win! So, here are some photo's of progress so far. Next job, transfers. Painting sides and ends before assembly. Hi all, Twinklekev here again. So, its been quite a while since my last post. Things haven't been great on the health front and there was an enforced change of employment but things are starting to look up. So much so that the kit building has started up again and a 4x2 base board has been constructed and is now awaiting track. Anyway, kit building; so here we have a Slimrails open C as built and a Peco 7 plank wagon modified to represent an open B. Further updates as they happen. Finally found some time to do some modelling so I made a start on the NGS kit 48 which has been hanging around for a few months. So here we have the LMS D1892 5 plank open body; assembled and ready for the paint shop. I want to get this one finished first before I tackle the GWR O32 that is the other part of the kit. Everything is looking good and I'd be keen to see how things turn out. Keep up the good work. OK, so progress has been made with the LMS 5 plank open. I decided to start on the GWR O32 5 plank open. Again, here we have the finished body ready for the paint shop. Which I'll get around too in the next couple fo days. More progress has been made. 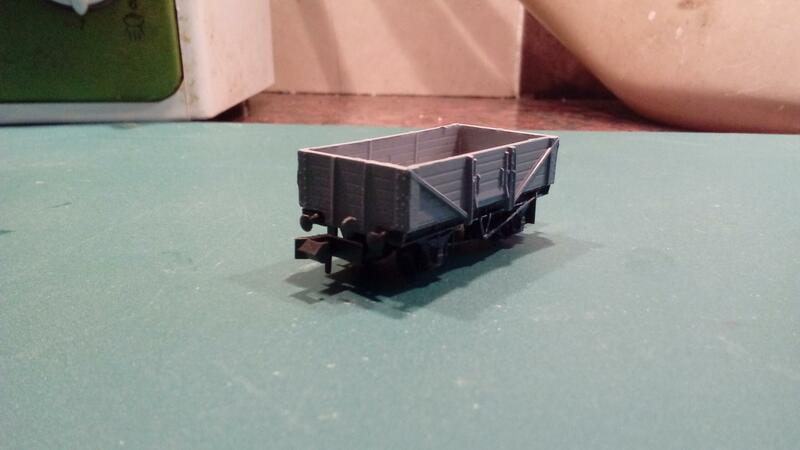 I now have a painted body fitted to a chassis; so one rolling wagon. 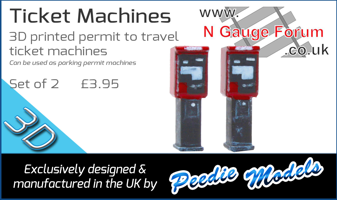 As you can see; finished in GWR freight grey. 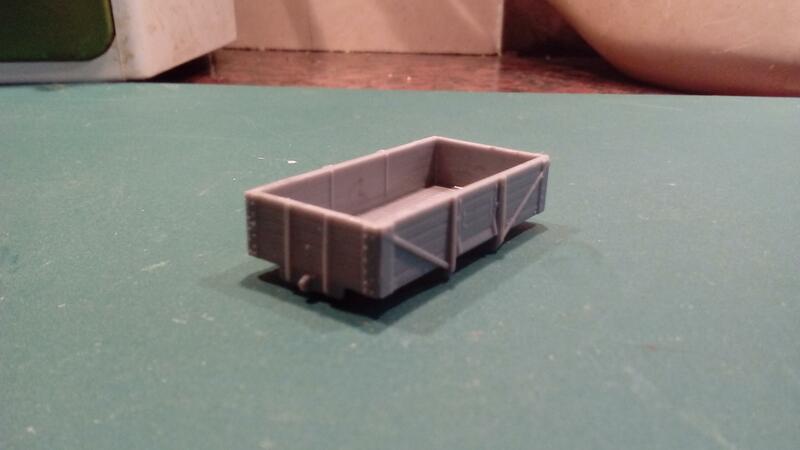 I've made this one as an unfitted wagon but I have to wonder at the logic of providing two vac brake cylinders in the kit but only enough hoses to do one wagon? 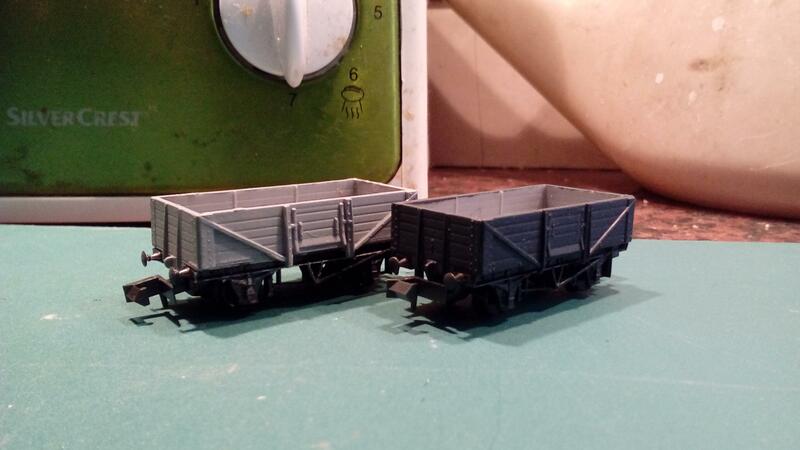 Anyway, I now have two wagons ready to have the finishing touches done. I'll post a final update once I've done the decals and varnishing. Final update for the 5 plank opens. Anyway, NGS kit #47 has been ordered so that I can make the steel ended LMS open that goes with these (as per plate 8D on page 36 of "The LMS Wagon" by Essery & Morgan; pub David & Charles 1977). I'll post progress on that build once the kit arrives from the NGS shop. 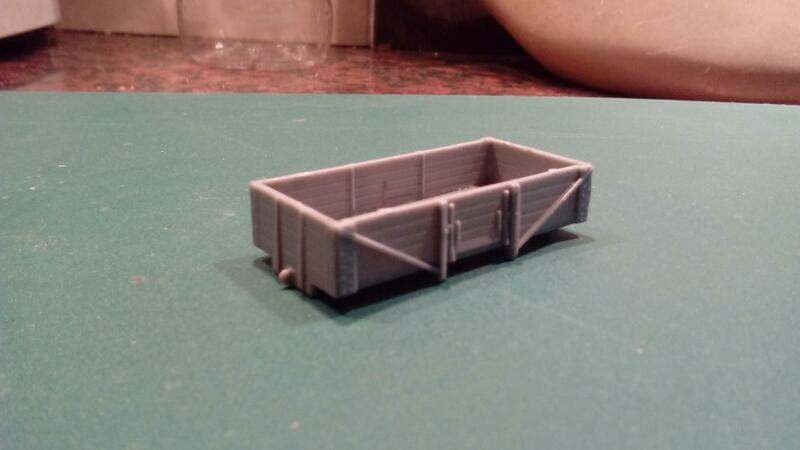 Excellent work, I find making wagons quite satisfying. 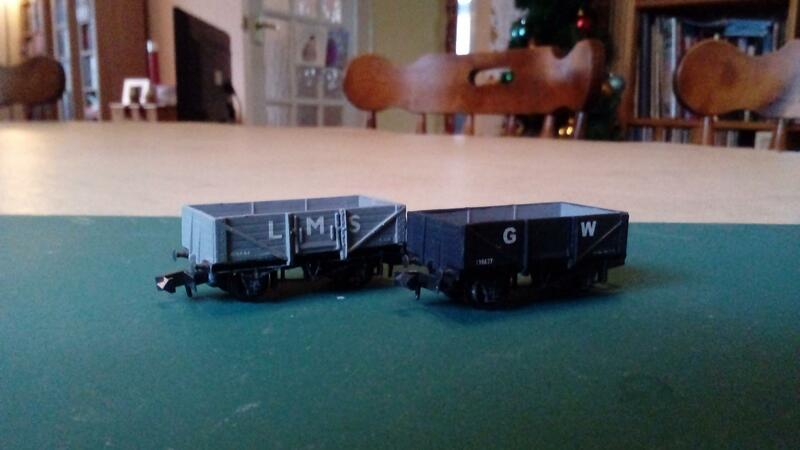 Did the LMS paint the solebar the same colour as the wagon body? Me too. And in answer to your question; the kit instructions say yes but I find doing the black bits way to fiddly at my time of life plus the "ol" eye's aint what they used to be, so I apply rule 1. 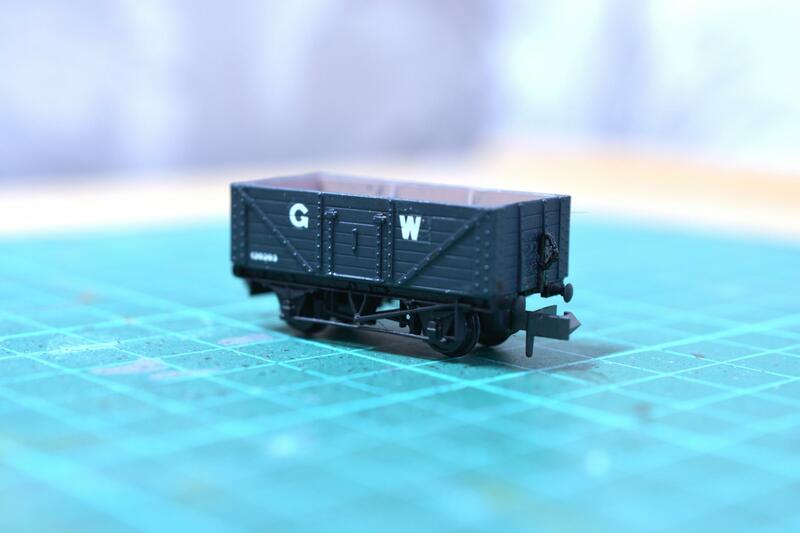 I only need the LMS half of this twin wagon kit as the LNER all steel open is too new for the era that I model (late 1930's GWR). But it should be possible to back date the LMS open and for me to make one of the original 100 built in the early 1930's by the LMS. Anyway, that's the plan.